This book was a great book for self-reflection. It gives you many questions that you can ask yourself to help you learn about who you are. A.C. Ping seems to relate to reality well because of how he uses situations to get his point across. He had been through a rough time after losing his marriage and he looked to himself for the answers on how to get himself out of the hole he had fallen in to. Throughout his book he asks the reader questions on fairly deeper levels and the questions are somewhat out of the ordinary. However that is an effective way because it helps you learn quite a bit about yourself. I learned because of how hard the questions made you think because there was a difference between answering the questions and answering them honestly. The honesty part made things very interesting as you were forced to be real with your self and not sugar coat anything. Once I was able to look and see myself in a non-biased way then I was able to adjust on who I was. Overall it is a good book for self reflection. I will guarantee you that you will learn something about yourself. What it is will either be good or bad but no matter it will be valuable. Where Eckhardt Tolle crystallizes his message with mesmerizing brevity, Ping’s (Do, Marlowe & Company, September 2004) attempt at the same trick only blurs his points. This disjointed work is bereft of any unifying principle and introduces concepts only to be orphan them; reading quickly becomes a chore. Occasional messages surface (e.g., don’t be ruled by money, begin to improve yourself right now), but vagaries are more typical “get serious but be kind, pursue your goals but embrace unity and oneness.” Platitudes (e.g., “Reclaim your freedom. Pursue your dreams”) are incessant, and gratuitous profanity and unnecessary references to drinking and drugs distract. Even the thread of anti-capitalism running through the book feels watered down. This ultimately unhelpful self-help also lacks how-to; dust off Mihaly Csikszentmihalyi’s Flow.Find reviews of books for men at Books for Dudes, Books for Dudes, the online reader's advisory column for men from Library Journal. Copyright Library Journal. 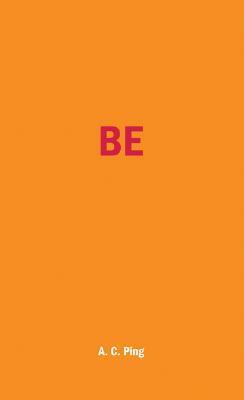 Be is very inspirational for me, a real eye opener to the world around me and even myself. This book talks about finding who you are in this society that tells us who we have to be. This book made me really think, and want to live in the present, to embrace and except what’s happening. Though to also live the life you want and desire to live. This book does not give you answers on how to live your life, but takes the fog away for you to really see your life as it is. The author just helps give you a small nudge to see what you really want out of life. Great book really made me think, I would suggest those who are in there twenties or early thirties to read this. Otherwise thank you A.C. Ping for a great eye opening book. This brief, insightful book helped me better understand why it can be so difficult to find purpose in one's life, and laid out concrete steps to get there. One must create action and movement in order to fulfill a purpose, and one can (only?) find happiness in this process. It argues vehemently against chemical escape. One must be still and clear his or her mind in order to get in touch with the true "Self," discover core beliefs, and construct an ultimate vision for life. Finally, Ping teaches that things will inevitably go wrong, and that we must accept life as it is and realize that everyone is in it together. Rather than get stuck in a loop where past regrets inform present hesitations, it is better to use future hopes to inform present actions, as well as maintain a presence in the moment. I found this book to be of great use to me. it's definitelly not for everyone, but if you're in search of something and trying to figure out how to be happier with your lot in life, this isn't a bad place to start. It's one I'd actually recommend buying as there are exercises to complete. I found some of them helpful and some of them things I already knew.But a few of the concepts I am trying to incorporate into my day-to-day life. Great little trilogy to read - philosphical and inspirational in a light hearted manner. When you reach that point when you say - "Is that all there is to life?" Read over and over and define the new you! great book, To help and guide you on self improvement and discovery. I'm loving this guy. Straight forward, not mystical or new agey. Great for anyone. Has qusetions to ask yourself, and little exercises periodically through the book.